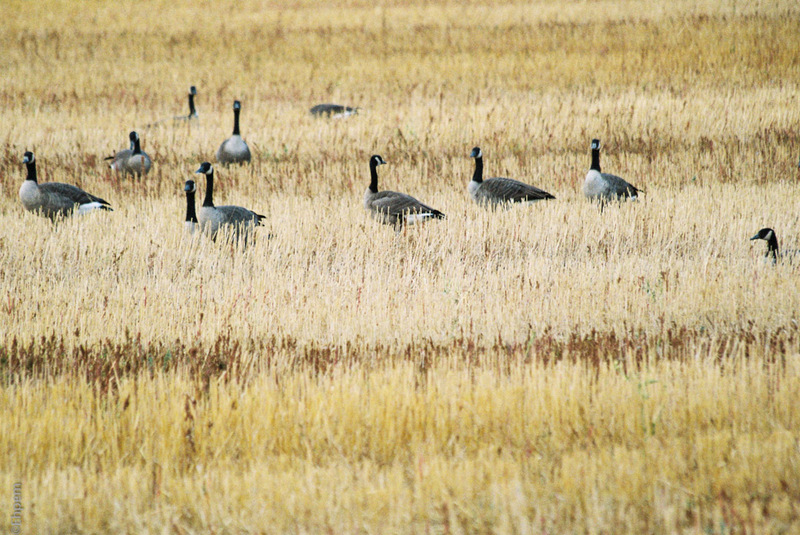 Another sign of autumn – geese among the stubble beside pumpkin fields. Canon Elan 7N, EF 70-300/4.5-5.6 lens, Lomography Colour 800 shot at 400 ISO. Film developed & scanned by Canadian Film Lab. Thanks Lynn, I am glad you like it and appreciate input from an artist. I had been wondering if the composition is a bit awkward – the geese a bit high in the picture perhaps. I think I prefer the version I posted last week, a straight abstract without geese, http://wp.me/s1R4lY-stubble. But it is not really a “version”, but an entirely different picture. You could try cropping even more off the top, making them even higher in the frame, and maybe cropping a bit from the left, even taking half the first goose out, which would echo the last on eon the other side, if you get what I mean. There are so many ways to go, and framing and composition are so difficult sometimes! The other shot is nice because it’s on the diagonal, and diagonals almost always looks good. Thanks Lynn, some good ideas there. I think I will do a blog with a few of the options. What you describe is pretty much the image I started with, before cropping, complete with an amputated goose on the left and more foreground. Perhaps I should have trusted my eye-through-the-viewfinder more than at-a-computer-screen. I also have another shot from this spot, which includes a band of green and orange pumpkins along the top of the image. It is my least favourite, but it might be better than this one.